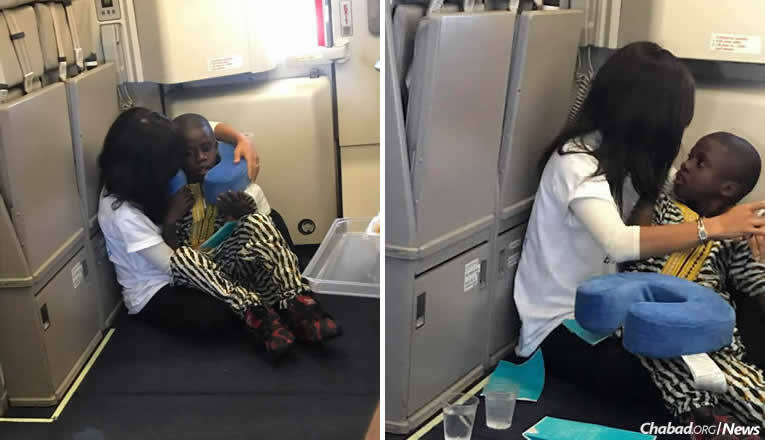 Chabad-Lubavitch emissary Rochel Groner comforts a boy with autism on a transatlantic flight from Europe to the United States. The description of a comforting and positive encounter on a recent flight from Europe to the United States has gone viral. 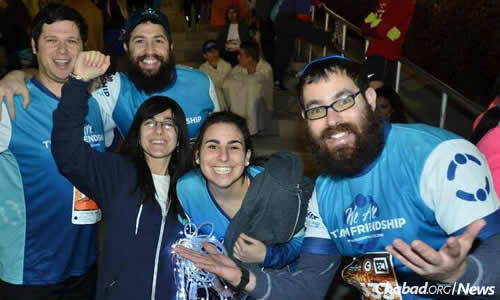 On a flight back from Israel after chaperoning a Mayanot Taglit-Birthright trip, Chabad-Lubavitch emissary Rochel Groner found herself in a unique position to help a fellow passenger. An hour into an eight-hour connecting flight from Europe—and after a three-hour delay before takeoff—a young boy with autism had a meltdown. “You could hear his cries throughout the plane,” wrote Rabbi Bentzi Groner, who along with his wife, Rochel, co-directs the Charlotte, N.C. chapter of Friendship Circle and ZABS Place, an upscale thrift boutique shop and employment-training center for young adults with disabilities. A “meltdown,” which appears similar to an extreme tantrum, is a response in people with autism to sensory overload. “You could feel the tension among the other passengers,” he continued in a Facebook post. The child’s parents seemed overwhelmed by the situation, and despite no overt comments from other passengers, “it was getting very uncomfortable,” related Groner. So Rochel Groner introduced herself to the boy’s parents as a professional caregiver and extended her hand to the child. He reached out and took it. They walked together to the bulkhead, where she sat rocking and playing with him for a few hours. The post and photos of the encounter have gotten thousands of reactions and been shared on Facebook more than 500 times. “This is the most beautiful story I have heard about in a very long time. We need more Rochels in this world,” wrote another. Rochel Groner, center left, and Rabbi Bentzi Groner, right, at a Friendship Circle event. The child is not Jewish? Are we sure? How do we know that?